Chris Ferguson, the poker player known as “Jesus,” is a man of many talents, not just poker. His most well known talent, after poker, is the ability to cut all sorts of objects, most commonly vegetables, by simply throwing playing cards at them. With his “Jesus” look, stylish outfits, and myriad other talents, Chris “Jesus” Ferguson is a highly entertaining character. Chris Ferguson has been playing cards all his life. At one point in 4th grade, Chris lost his last bit of change when his trip queens lost to a flush. It was this event, so early in life, which formed his resolve to never go broke ever again. He never did. Chris would frequently come out on top at home games during high school. As life went on, Chris “Jesus” Ferguson went off to college at UCLA, where he would spend the next 18 years of his life, five as an undergraduate, and thirteen years as a graduate student. UCLA had to kick Chris out of school to make him leave, but they did award him a Ph.D. in computer science in 1999. Chris Ferguson kept playing cards throughout college. He started playing over the internet on an IRC channel, a text-based chat room where no money was involved, before the internet had become as widespread and accessible as it is today. Chris frequently won wherever he played, be it on the internet, in Las Vegas, or in the small tournaments around LA that he began playing in 1994. It didn’t matter whether the games were for money or not. Chris Ferguson played to win. It was in 1995 that Chris played in his first World Series of Poker tournament. He didn’t play a lot of tournaments before he received his Ph.D. but he always did well, frequently placing high in the money. It was in 2000, though when he earned his spot in poker history, by defeating T.J. Cloutier to win the World Series of Poker Main Event. The bracelet he won at the Main Event, was his second of the year, having won a bracelet in Seven Card Stud as well. “Jesus” also went on to win the Omaha Hi/Lo tournament in 2001, followed by two more WSOP wins in 2003, for a total of five bracelets. 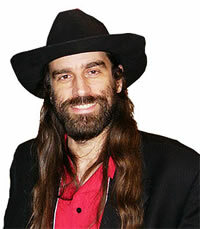 Chris “Jesus” Ferguson is best known for his role as a Full Tilt Poker sponsored pro. Due to Black Friday in 2011, Chris is no longer helping players improve their games by playing online.